Mad Hatter's Pantry: Vegan MoFo - Final Day! My favourite blogs this year have been Hasta La Vegan (some crazy recipe choices to veganize) and vegan.in.brighton (making me hungry with every post). Both have been a pleasure to read. I hope you have all enjoyed the month too! Which have been your top blogs? And now as we say goodbye to MoFo for another year, I'm going to post a recipe that is looking forward. Dare I use the big C word? That's right... this recipe might come in handy for CHRISTMAS! 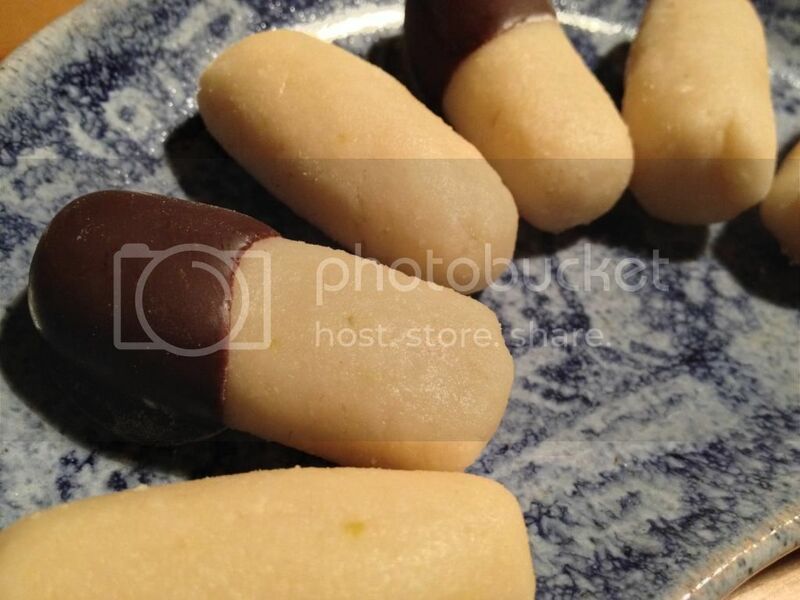 Now I must admit, it's been ages since I've had marzipan. So I'm not sure how authentic the taste/texture of this recipe is - and Mr Hatter doesn't like the stuff so he wouldn't even try a tiny piece! But I can tell you that it tastes fantastic and you should make it right now. 1. Combine the almonds and icing sugar in a bowl, and mix together. 2. Drizzle in the Sweet Freedom, lemon zest and extracts. and stir. The mixture should start to clump together. 3. Add water 1/2 tsp at a time and mix until a dough forms - you may need more or less than the amount stated, so just add a little at a time as once it's in there you can't take it back! Knead lightly until a soft dough forms but try not to overwork it. 4. Wrap in cling film and refrigerate overnight. 5, Remove from the fridge and use - you could shape it and dip into melted chocolate (which I did), use it to cover a cake, or just eat it as it is! Once nominated, you receive a list of 10 questions from she/he who has placed the nomination, which the nominee must answer. Then, the nominee must nominate 8 other blogs, let them know you have nominated them, and put a link to their blog in your post (no tag backs). Nominees must have under 200 followers. You must tell the blogs that you nominate them. Aww thanks :) I think you deserve some congratulations for sticking with your theme - it can't have been easy! Eeek, thanks for the mention Jessie. I've been loving your MoFo posts too, so much deliciousness, but also there were kitties which is always a win in my mind!